The five bedroom holiday home is nestled amidst well-maintained grounds and boasts wonderful views from most of the spacious rooms, as well as the terrace area. 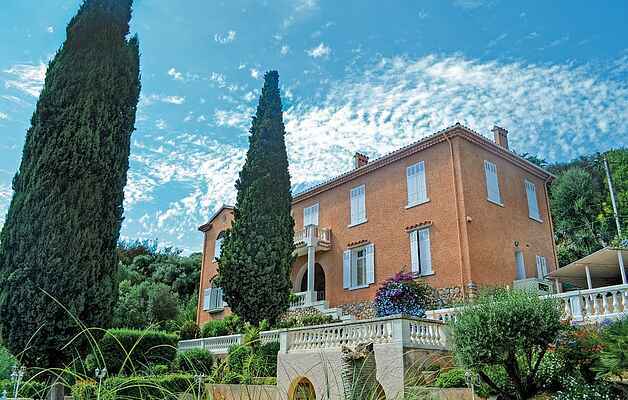 It has been thoughtfully decorated and offers plenty of space for a relaxing holiday on the Cote d'Azur. The spacious terrace area is a wonderful spot for alfresco dining, whilst the outside swimming pool is very refreshing on a hot summer's day. Nestled between Marseille and Nice, Hyères is home to stunning vistas, delicious cuisine and award-winning beaches. It may come as no surprise that the town has been frequented by aristocracy since the 18th Century. The beautiful harbour in Toulon is roughly 20km away and the iconic town of St Tropez is roughly an hours' drive. There is also a fantastic selection of walking and cycling trails in the region, especially within the cool forests of Massif des Maures. Alternatively, enjoy a boat trip to the islands of Porquerolles and Port-Cros.